Art Shows, Craft Shows, Fairs, Festivals – It seems like there are more events popping up around Northeastern Ohio. As a vendor how do you choose what you will participate in and what are some qualities you would like to see in an event that might signal it as a favorable choice for you to participate in? Is it well established? An event does not have to be established to be good, but if something has been going on for 10-15 years or more there is a good chance it is well organized and has a faithful flock of patrons that visit the event. 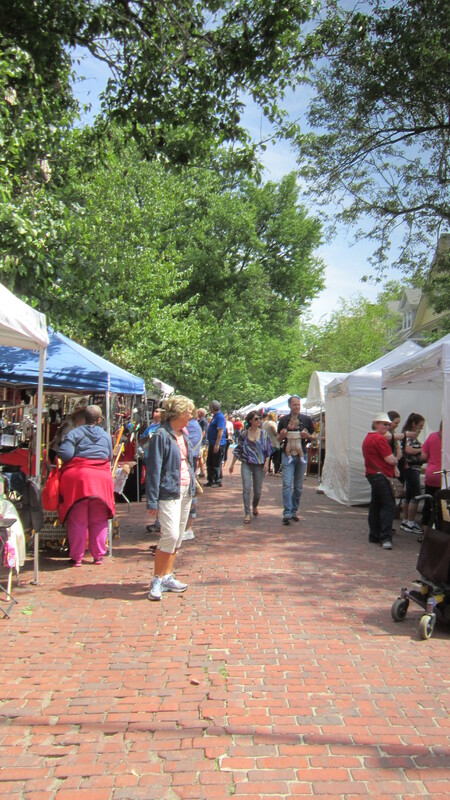 I subscribe to several art show ezines, and recently one featured an article on the Ann Arbor Art Fair, which was 2 weekends ago. The event has evolved over the past 40 years, and is viewed as a benchmark for how art fairs go across the nation. Patrons fly in from around the country just for the highly prized juried artists. And patrons are buyers… sales are good, no matter what the economy is doing. Well established is a good thing. Is it well organized? From the first blush of the application through the jury process and the feedback, instructions for setup, details the day of the event you will quickly learn that some events are highly organized, and well thought out, and others are flying by the seat of their pants. It can be simply planning where each vendor artist will be, or planning to mix up the genre of work so no two of the same thing are next to each other. Organized is a characteristic that soothes the questions and anxiety of artists…. And the ability to anticipate anything or have a plan for it is just good practice. We were at a festival in the height of summer, with temperatures in the high 90s. You could not move without sweating profusely. That event coordinator had her staff walking from tent to tent with a big 5 gallon cooler of ice water to make sure everyone was keeping hydrated and cool. wow… awesome to be thought of like that. Another summer show outdoors were dilligent to watch the radar, and alerted us to pack up with enough time before a strong and fast moving thunderstorm rolled in without notice. We had just shut the suv hatch after putting the last of our things in when the rain suddenly came. Is the reputation good? OOH, this is a tricky one. But lets be honest. Once you have done a few events you begin to sense which shows are good and which are not. Good does not always translate to highly profitable, but good is a balance of a blend of fine artists, well crafted products, great presentations, and a great advertising and marketing campaign. As almost a courtesy to fellow artists comes a chatter – what are you up to? where is your next show? Oh, have you ever set up at such and such? Quickly a pattern emerges of what has a great reputation, what does not. One local promoter is great at the marketing, picks lovely venues, advertises the heck out of the events, but she does not filter who she has in the event… so there are 50 jewelry people, most stringing beads from pat catan or michaels, and she has 10 people that sew purses of tapestry or cloth. And she packs them into the venue like sardines. Yes, she draws a crowd to the event, but it is a looking audience, not a buying audience… so vendors sit there, smile, and wait, and wait, and time ticks on, often the day ends with artists not making back cost of the booth. Reputation – oh you betcha everyone knows about her shows, and once was more than i care to do again, thank you very much. Who is the audience? This one is subjective to what you sell. For my silk it has to be a crowd that likes more stylish, artsy things.. generally middle age women and generally socially upward. Soap on the other hand is appealing to almost everyone. If you sell art or handcrafted products, know your audience, and keep that always at the center of your efforts. If the event does not draw your audience, dont do it! Where is the venue? Is it easily accessable to all? Outdoors, or Indoors? Are you prepared with the right equipment for the event? Tent, tables, chairs, coverings for the tables, signs, and the like. Outdoor events are always weather dependent… and it is easy for a weather event to completely destroy the day, your products and your hopes. If it is outdoors, is parking close? How far do you have to haul your things? Is the event juried or not? We love juried… it means that the quality and the type of art selected is filtered, elevated, and will draw an art loving, art appreciating crowd of buyers. Not discrediting non-juried shows, but I have grown weary being lumped in with the “crafts” crowd. Juried shows are carefully arranged… requiring the artist to submit photos of their work and in some cases also requiring video or written documentation of their process. This is wonderful that juries ask for proof. In recent years there is a rise of not so handmade goods flooding these art shows and fairs, often products made in China, and repackaged by the so called artist. We want it honest – only asked to participate if you have proof of having handcrafted the goods. Cost – Cost has limited us often to smaller, less than amazing events, but we realize that when we pay more for an event, often there is a correlation that costlier events drawing a larger buying crowd, and we make more sales. Actual Sales – The only way to know how it will result is to commit to an event, publicize it, set up and sell your heart out. Actual sales of an event can be misleading, because from year to year this may also change. One event we did in 2011 was awesome, and we had wonderful sales. In 2012 the crowd was thinned out, an older group, and we made perhaps half of what we had done the year before. From year to year it is clear that there will be economic and sociological factors that modify outcome. Since the economic crash a few years ago we have seen a loss of that expendable income for so many people. (On a personal level I no longer have the extra funds to have fun money for artsy purchase.) With a decline in the amount of free spending money these days comes a decline in sales… economics 101 in action. Your comfort level – Are you a risk taker, willing to adventure to a distant location, or an uncomfortable surrounding? Or are you looking for something predictable, tried and true? I did an art show that was edgy once, and i was the only one in the room that was not tattoo’d and pierced or wearing leather. Needless to say I was uncomfortable, and the adventure was less than profitable. Sometimes risk taking is good. Sometimes not. That is my short list… I am certain there are at least a half dozen additional points to make, but for this post I think this is sufficient. Get bold, courageous, and get out there and meet people. We love that part about our business… meeting, talking , watching people… and watching them react to the art is wonderful.